Soon iOS application functionality might be added to the Apple TV. Steven Troughton-Smith is known to be exchanging ideas with a developer named TheMudKip. 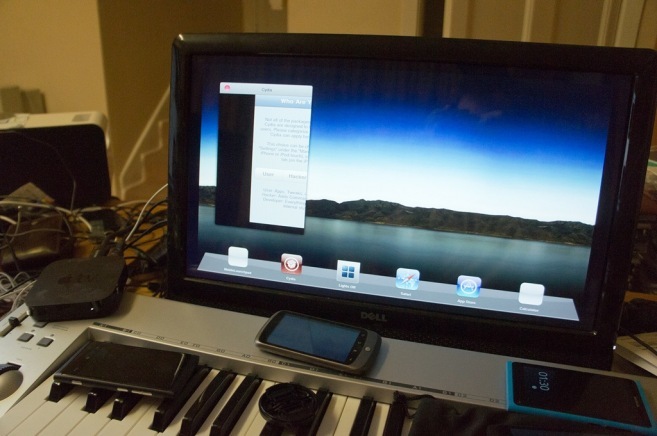 The iOS Spring Springboard is the software that powers the app launcher and had to be rewritten in order to achieve the task of running iOS applications on the Apple TV. The concept of running iOS applications was proven even though he tweak is still at a young age. Details after the slide. One thing that will benefit the users is that a new feature will be added due to the rewriting of the Springboard. The feature will be side-by-side apps. The concept was demonstrated on an iPad early at WWDC 2011, but has been considered to be more powerful and much more important for Apple TV. Wouldn't it be wonderful if we can have a big view of what is going on around the world by opening several news applications. Here is the exclusive video of the concept. We have already heard that Apple is going to increase the battery capacity of the new iPad. Now this news about Apple TV shows that the fruit company has big plans for 2012. 0 Respones to "iOS Apps Running on Apple TV [Video]"